It is a state in which an individual has insufficient physiological or psychological energy to endure or complete necessary or desired daily activities. Factors that can lead to activity intolerance may include side effects of medication, extended bed rest, living a sedentary lifestyle, regular restrictions to healthy activity levels, improper oxygen supply, deprived sleep, lack of motivation and severe stress. Abnormal blood pressure or heart rate level in response to activity level. Assess physical health level and potential injuries and illness. Measure and evaluate patient’s cardiopulmonary status. 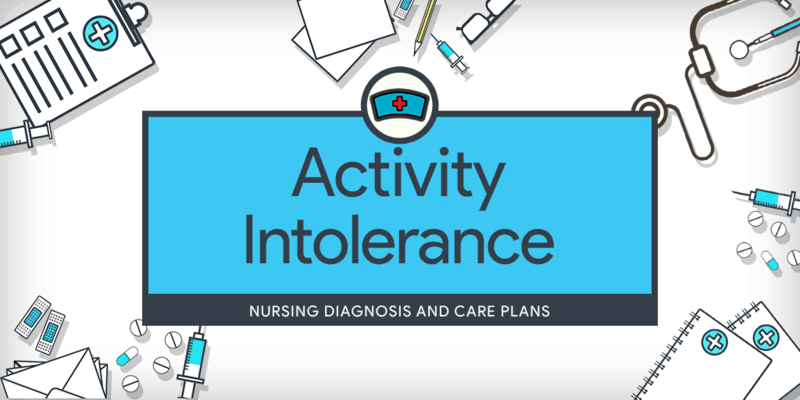 Regularly discuss with the patient, concerns related to their activity intolerance in order to address problems and determine the root cause of their activity intolerance. Evaluate sleep quality, length, and patterns. Observe and assess emotional responses to performed activities in order to identify and address potential stress responses, depression or mental-emotional conflicts. Assess mobility level prior to exercise, stretching or other interventions to ensure the patient does not injure or over-stress him/herself. Assess and evaluate nutritional health habits to identify dietary needs and food-related concerns. Observe and record skin integrity throughout the day to check for symptoms and health status. Encourage physical activity, develop proper patient exercise programs and ensure they are followed regularly to help prevent muscle atrophy and strengthen the patient&apos;s cardiovascular system. Allow proper rest periods in between individual exercises to ensure optimal performance during sessions. Help patients with planning and scheduling activities and providing direct feedback on performance and improvements. Help patient develop a proper diet plan and eating habits to help them improve their overall health status. Assist with activities of daily living regularly as indicated by the physician or supervisor. Encourage patient to develop good breathing habits in order to improve cardiovascular functions and reduce stress levels. A patient is able to provide positive verbal feedback in response to activity level. A patient is able to display and use effective energy management. A patient is able to perform basic activities without excessive exhaustion or loss of energy. A patient is able to display physiological improvements over time. A patient is able to maintain regular cardiovascular and respiratory functions during activities.